Remember the famous Mourinho bus that used to park itself firmly in front of our goal? Well I’m not going to suggest the wheels have come off because it would actually be a bonus if that had happened, or at least if it happened in the right place on the pitch. No, as the weeks go by, it’s looking more like that bus has gone on a beano. It’s gone on its jollies, as far away from its day job as it can get – and Eva Carneiro might well be in the driving seat. That’s not to say the Chelsea medic is to blame for everything that is wrong at Chelsea this season – although she’s certainly one of the apparent symptoms of Chelsea’s current malaise – the rumours surrounding her off duty exploits, along with the recent disciplinary sanctions however, would suggest she’s more than upset the apple cart. The question is, why has Jose Mourinho let it affect him and the rest of the Chelsea players so much? And why is this season all too reminiscent of past woes? Jose Mourinho first arrived at Chelsea Football Club in a blaze of publicity. He’d just won the Champions League with Porto and was quickly hailed – by himself and every Chelsea supporter – as The Special One. In the first of our back-to-back title winning seasons he was a breath of fresh air to a Premier League accustomed only to Messrs Ferguson and Wenger’s verbal sparring. Mourinho added a new dynamic with an air of self assuredness bordering on cockiness, his infectious confidence and the sort of effortless charisma even the most Neanderthal badass would find attractive. By the second season, whilst we still idolised him, the press started to look for chinks in his armour, the opposition started to find them and the cracks started to appear. By season three, the press had gone full-on anti Mourinho, with reports on everything from a rift with Roman and lack of control over transfers, to an arrest over his dog. The media circus was in full flow, the world and his wife took bets on possible outcomes as Mourinho lurched from one embarrassing outburst to the next and CFC was more akin to a bad soap opera’s local than a title holding Premier League club. Fast forward to this season and we’ve already had a set-to with his medical staff amidst reports of extra marital affairs, stories about our bad boy frontman flouting the rules and the boss effing and jeffing at the opposition. So, apart from all of this again affecting our performances and results what’s the common denominator? The only one I can see is John Terry. Far be it for me to jump on the rest of the Premier League’s bandwagon of belief that everything wrong in the world of football must be the Chelsea captain’s fault but I do find it more than just a little coincidental that both in 2007 as at the start of this campaign, Jose Mourinho has upset the Chelsea stalwart. Having agreed with the rest of us that John Terry had just had one of his best seasons at the club, a clear change of heart over the summer led to the cardinal sin of hauling the Chelsea favourite off in a crucial fixture against City. 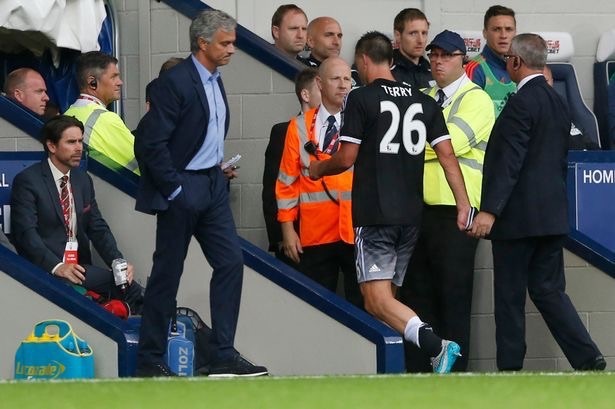 Such a public display of a lack of confidence in Terry was never going to sit well with anyone at the club, so add to that upsetting a much liked, attractive female on the staff, and Jose Mourinho really was on a hiding to nothing. What we hear is that this particular member of the medical team has been administering some very special treatment to the under-performing Branislav Ivanovic – and his woeful application to the game so far this season certainly suggests his mind is elsewhere. So it’s a fair bet this inappropriate liaison came to light during the summer. What we haven’t heard about yet is quite how Jose Mourinho might have responded to this in private – and what the rest of the squad make of it all. It’s hardly a secret that the Chelsea captain has the support of his teammates – and more importantly, the backing of the club’s owner. It’s also old news that he’s dabbled in the odd bit of extracurricular activity himself in his time, so he won’t have been that likely to stand in judgement of his fellow defender. Jose Mourinho, on the other hand, is a family man and one you’d imagine would find any form of hanky panky outside of a marriage distasteful never mind inside his own dressing room. So there’s every possibility that the latest disagreement between the Chelsea boss and his captain didn’t start as a football related issue. Of course, this is all surmising that an internal affair could have such an impact in the dressing room to throw the holding champions into complete disarray over the course of a summer – or at least the way it’s been managed. And there’s obviously more to it than that, with Fabregas going off the boil well before all of this blew up and our defence needing the sort of work even Eva couldn’t provide for just as long but we all know what happened the last time Jose Mourinho and John Terry went head to head. Our current form is all too reminiscent of that time. Playing with shoulders hunched, heads down and mouths closed, Chelsea invite a battering every week. It’s hard to imagine this is the same side that won the title fairly comfortably last season because just as in 2007, this is a Chelsea side confused about its allegiances and lacking leadership. And just as in 2007, when this latest mess reaches crisis point, Jose Mourinho has a choice to make. In 2007, he chose to walk/be fired/leave by mutual agreement (delete as appropriate) but the way I see it, this time around there’s another option – he could fulfil his promise to stay – and sort it out. Both Carlo Ancelotti and Guus Hiddink employed ‘clear the air’ talks in their time at Chelsea, times where we looked in just as much danger of self imploding as we do now. So, now would be the perfect time for Jose Mourinho to put the players in a room, take a step back – and lock the door until whatever the roots of our current troubles are pulled out and disposed of in the depths of the sort of hole that’s threatening to engulf us if he doesn’t. The question is: given its his third season, is that an option Mourinho will actually recognise?